Ani has done nothing less than change my life. She has slowed me down to a more healthful pace and expanded my capacity to love. One tiny puppy mill breeder momma crawled into my heart and made it bigger. 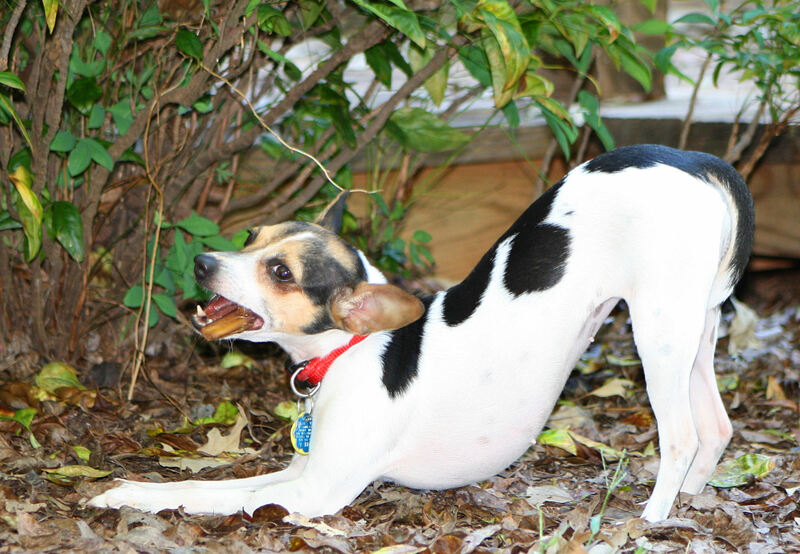 Ani is a toy Rat Terrier and was the last of 143 dogs rescued from appallingly squalid conditions. She was considered unadoptable because she couldn’t tolerate the slightest human touch. When I was able to take in another foster dog, I went to get her for New Rattitude Rat Terrier Rescue. She was frozen in fear and kept her eye on me from the crate through every hour of the drive home. I was practically grinning during that drive, I was so happy for the opportunity to rehab her. “Blissfully ignorant,” I believe that’s called. I had rehabilitated many fearful dogs, but what I didn’t know was a lot. I assumed that Ani would be a challenge to housetrain, but I didn’t know that she was the Jackson Pollock of poop. She would poop on the floor of her exercise pen and happily romp through it on the way around her crate. Stopping inside her crate to scratch around in her blanket, she’d tromp back through the poop to excitedly paw at the wire panels. She’d wag her curled tail, dance around, and fling more poop. I cleaned up a lot of signed originals. I didn’t know that my softly voiced “it’s okay” would be terrifying to Ani. She would run and tremble, frightened out of her mind at hearing the sounds humans had used when she was held down for medical treatments. I didn’t know that would break my heart into a thousand pieces. I didn’t know that her initial intense interest in me was mostly hypervigilance. Accustomed to speeding through life with far too many entries on my to-do list, I had to learn to be mindful of every move and every sound I made. Suddenly everything I did mattered to this little dog. It mattered how I removed my socks when changing clothes. It mattered how and where and at what angle I sat on the sofa. It mattered that the fork was carefully placed into the sink. Above all, it mattered that my hands came nowhere near her body. I do know now what joy one little being can bring into a life. I know well the barely-contained thrill of the first baby steps toward bonding. The first touch of a tiny wet nose on my hand. The first happy, bouncy barkfest upon my return home. The first calm look into my eyes. The first tug on my sleeve to play. The first time Ani let me pet her, tears of happiness quietly rolled down my face. Ani wants to connect, so she’s figured out a way to do that without involving human hands. She “kisses.” She kisses a lot. She kisses to reconnect for every greeting, every good feeling, and every time she needs reassurance. She snuggles into me and gives kisses when I am lying down. Now I can say, “It’s okay,” and she looks at me like maybe it is. I am in awe of her resilience and ability to trust. I currently have seven terriers living with me, some my own and some foster dogs, and I love all of them. I’ve always learned so much from dogs. But Ani brought some extra magic with her that made me just a little bit better as a person. A little more patient. A little more kind. A little softer. When I think of her, I always feel her in my heart. New Rattitude gave me a gift by agreeing to let Ani live with me for the rest of her life. Ani gave me the most precious gift of herself. Such a wonderful essay. Ani is so lucky to have found you!